Mixed media, as its name suggests, is where I mix different media, such as paint, print, drawing and collage, in one picture. Each medium has its own range of marks and I use these to create the different image and effects I am envisioning. Collograph prints, for example have beautiful textures, oil bars let me draw with oil paint and collage allows me to play with perspectives of space and time. Creating my mixed media works is a very slow process which can take months. First I select torn-up fragments of print proofs, discarded drawings and trial pictures. Then I arrange these fragments, moving them around and trying different combinations until I am happy with the composition and the pieces are ready to be glued in place. 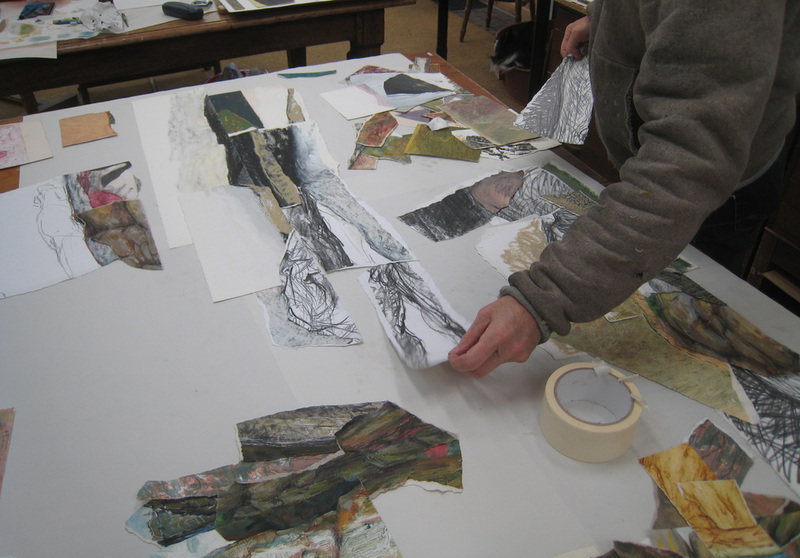 Then comes a long period of adding to the collage by drawing and painting with different media, including charcoal, graphite, oil bars, wax crayons, watercolour, pastel and acrylics, among others. Finally the piece must be signed, mounted and framed, and the artwork is finished at last!